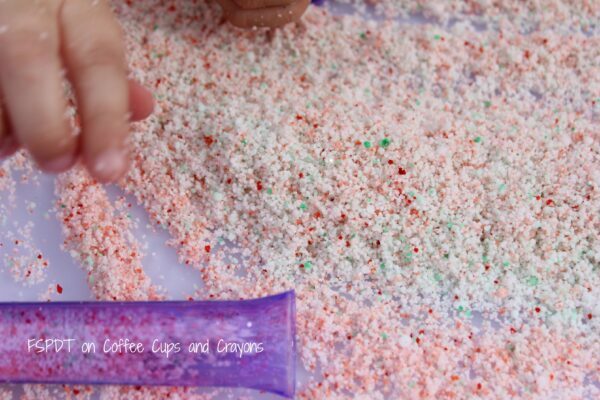 A few years ago I bought the kids a bag of Insta Snow. 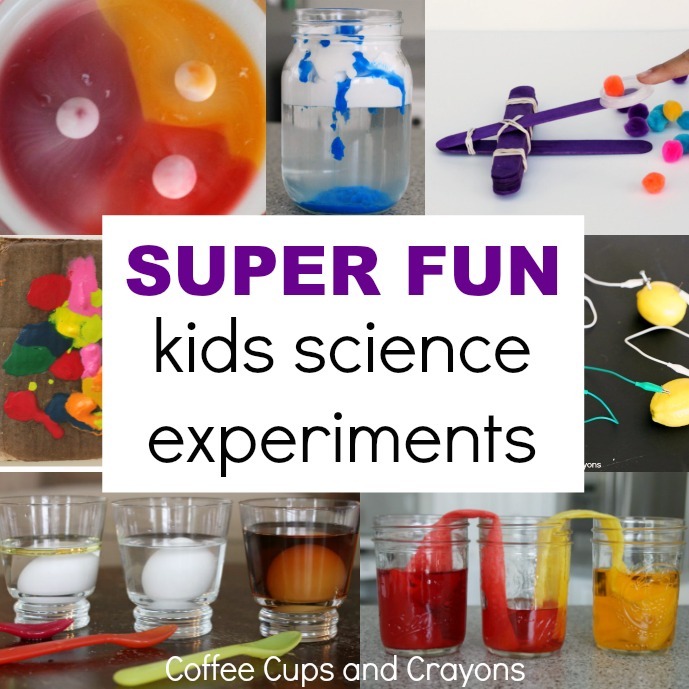 A fun science experiment all its own. This stuff is amazing! It grows a hundred times itself with water. Last year I wanted to try something new with it but, it sat in our sensory cabinet and did not make it out. This stuff (dry) stores great when not in use too. I have not forgotten I wanted to get the Insta-Snow out when Christmas and Winter came around again. Well, that time of years has finally come and we put it to use in extended Insta-Snow Science Experiments. The kids and I just loved this activity. It also doubles for sensory play. I poured Insta-Snow in a bowl and added some spoons for scooping. I then added water to our largest beakers for us to use for all the experiments. I made little labels for each beaker as well. This way we could keep up with what we were experimenting with for each beaker. I grabbed all our other supplies and set them on a tray. I keep cheep plastic table cloths on hand for messy activities. I grabbed one of them and put it on our table outside. We got lucky and had a beautiful warm day! We took advantage of it and went outside. My oldest 6yr, started with the smallest beaker first. This was just insta snow and water. Which, as I mentioned above, is amazing in of itself. We did not really measure a single thing for this experiment. Letting them just scoop and pour…. was even more fun for them. It let them put their problem solving to work too. Do we need: More water? More glitter? Less water next time? The kids then added Insta-Snow and peppermint oil to the next beaker. Then they poured water. They said this one needed more water than the last one. They mixed it up after the “growing” and sniffed to see if it now had a scent. They agreed it smelled like peppermints. We did a food coloring and then a food coloring #2. One had just food coloring and the other one had food coloring and glitter (because glitter makes everything better). My 3yr loved the one with food coloring and glitter. They seemed to love the Insta-Snow even more colored and sparkly. Last, but definitely not least, was the candy cane experiment. This was my favorite. Sometimes I enjoy their experiments as much as they do. The candy cane was a last minute thought as I gathered supplies for the Insta-Snow experiments. I was excited to see what, if anything, would happen when added to the insta snow. The kids added Insta-Snow to the last beaker. This was the one we had water in. 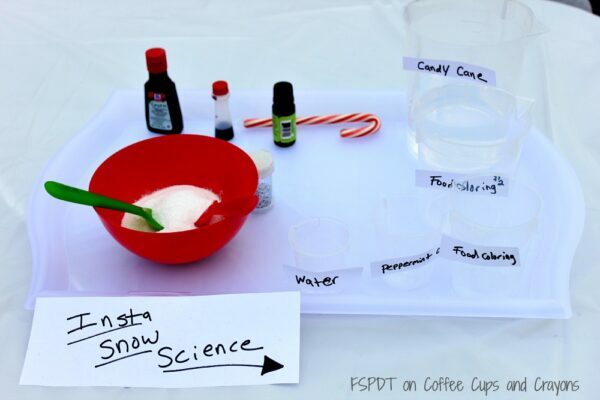 By now we had used all the water and they added the last of the Insta-Snow to the beaker. I took the now empty bowl and filled it with water for them to use. The candy cane broke while my son was unwrapping it. They put 2 small pieces in the bottom of the beaker. 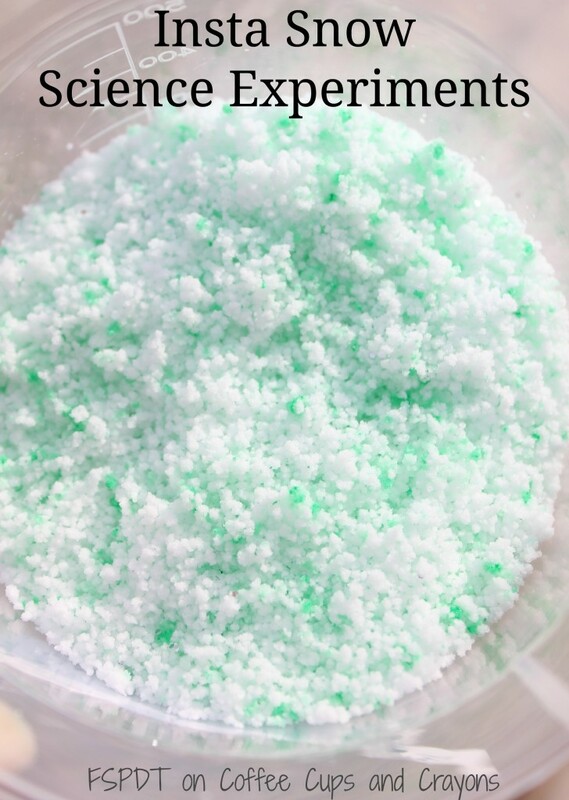 The larger piece of candy cane they stuck in the insta snow after adding water. We left the candy cane inside the snow. We checked it a little while later and noticed is was dissolving and the insta snow was changing color. It was now a light pink. 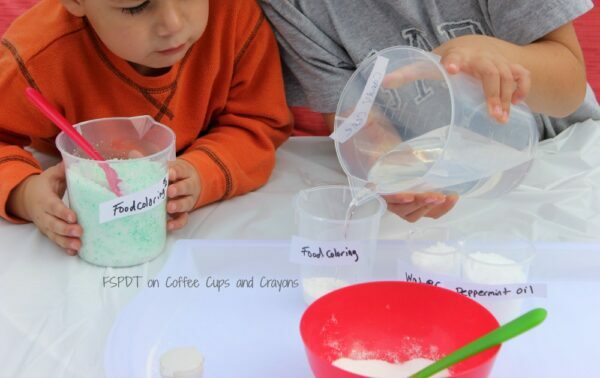 Now they started to mix all their other experiments together to create a fun sensory play activity. It went from experiments to open ended science to playtime! 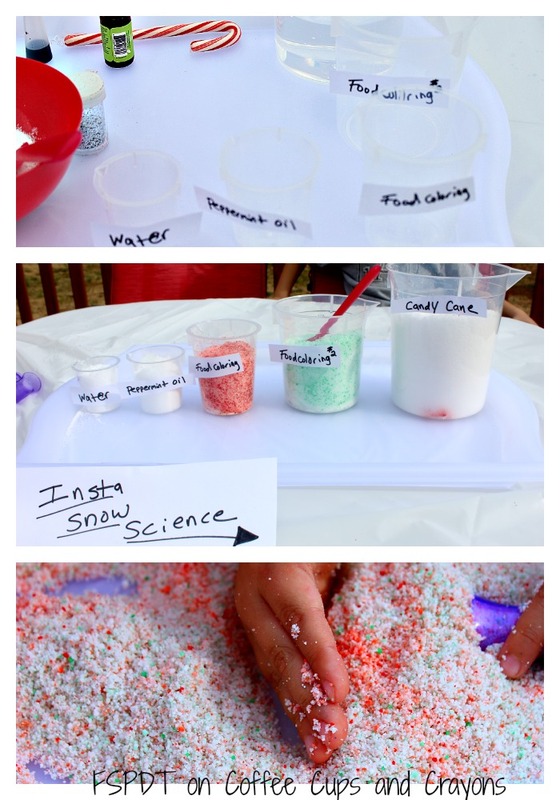 They had the Insta-Snow and some beakers and test tubes. They then created their own fun. Later they even got out their trucks and tractors to drive in it. I love seeing what they come up with! I love this! So far we’ve only played with the instasnow as is….. We are definitely going to get creative next time! Just bought some of this. 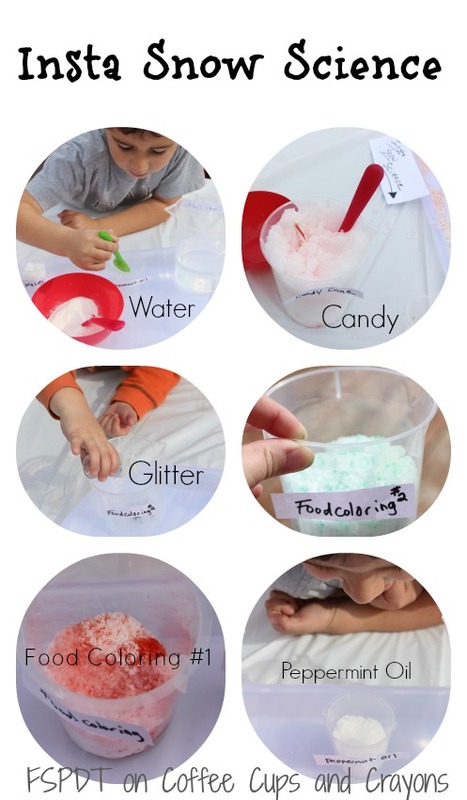 Thanks for the clever sensory ideas.